Imagine an all-female version of Ghostbusters where the new Ernie Hudson gets the biggest laughs, and Chris Hemsworth is reduced to (literally) a walk-on. 30 years ago? Oh man. So if was dancing at a Ghostbusters kids disco at the time that must mean I’m old as s**t. (They recently played the Ghostbusters record on Radio 2 so that should have confirmed it). – Personally I don’t think the trailer’s so bad, but I guess they really should have done that passing-the-torch movie with the original cast to ease things in, as I’ve been saying for years. Thanks for 86ing that Bill Murray. The plot goes like so: Erin Gilbert (Kristen Wiig) and Abby Yates (Melissa McCarthy) are a pair of unheralded authors who write a book positing that ghosts are real. A few years later Gilbert lands a prestigious teaching position at Columbia University, but her book resurfaces and she is laughed out of academia. Gilbert reunites with Yates as ghosts invade Manhattan and they realise it’s down to them and their newly formed Ghostbusting team to save the world… Leslie Jones plays Patty Tolan, a NYC subway worker who stumbles across the supernatural threat and becomes a new member of the team. Chris Hemsworth is Kevin, the team’s receptionist, echoing Janine from the original films. Andy García is the Mayor of New York City and little known comedian Neil Casey plays the villain (who, quite cleverly, will be the origin of the ghost in the logo). Bill Murray, Dan Aykroyd, Ernie Hudson, Sigourney Weaver and Annie Potts all have cameos but in non-Ghostbuster roles, since this is a full reboot which ignores the previous two films. An all-female cast may seem like an unusual move but director Paul Feig (Spy, The Heat, Bridesmaids) is the best director of female comedies in the business, especially coming off the back of the excellent Spy. He’s already got the best out of McCarthy and Wiig for those films. So I remain cautiously optimistic. 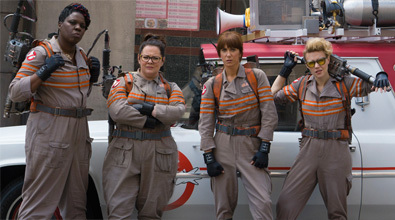 Ghostbusters is released in the US and UK on 15th July. I didn’t hate the trailer either, but I highly doubt that this will be as big a disaster as FANT4STIC was. The trailer is a disaster for a number of reasons, none of it having to do with an all-female cast or no “handing the torch”… it’s because the comedy & tone is too over-the-top slapstick-ie. What made the original Ghostbusters work was the dry humor and overall atmosphere of sly sarcasm. There’s also no sense of legitimate dread or scariness with the ghosts – this made for a good contrast to the comedy. Also, if you’re going to do a full-on reboot of a classic film, cook up a totally fresh story. Something completely new. From the looks of the trailer, they’re doing it all wrong. Assuming this trailer does accurately represent the film – and that it wasn’t just a historically bad trailer edit – this movie is going to be absolute garbage. This trailer (there are several more to come) emphasises nostalgia and then comedy. Sure the horror and creepiness could have played more but those ghosts are still pretty ghoulish if you pause on them – rotting skulls, dead-staring eyes and the like. I think that element will be in the movie, and expect the tone of future trailers to change. I believe you’re incorrect that the response is nothing to do with it being an all female cast. Regular readers of movie blogs were VERY sceptical about the idea when it was announced, it did not go down well, and today the rest of the world found out about that idea – their reaction has a lot to do with that. If there had been a passing-of-the-torch movie instead of Bill Murray trying to win an Oscar for years then this would have felt like a sequel rather than a remake. Sequels the public can handle, remakes of beloved movies they generally hate. What THE FORCE AWAKENS got right was the sense of mystery and wonderment that Stars Wars held when it first arrived. Ghostbusters was funny, sure, but it had a similar sense of wonderment. It’s not a bad trailer. The first Ghostbusters is great . The second one not so good. After that it was basically a toy franchise. 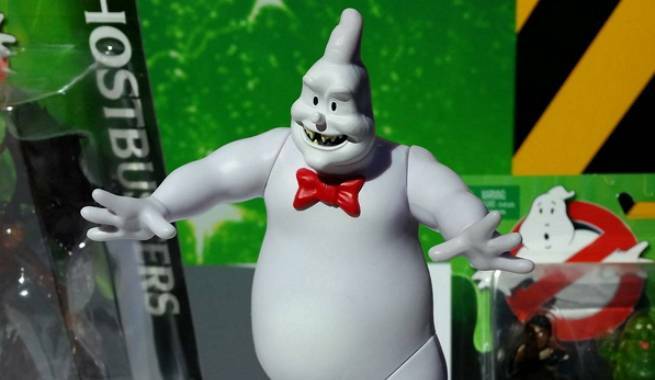 This will probably be better than the Ghostbusters II and do ok at the box office, but it will not shift toys, which I suspect is what Sony really want.